Objective of visit: To survey the current situation of the site, including the excavation trenches, the new asphalt road to Bocas del Toro as well as the ever changing coastline (due to geological movements). Fellow visitors: Faculty and students of the Institute for Tropical Ecology and Conservation at Boca del Drago (offering courses in tropical ecology, ethnobotany, herpetology, primatology and archaeology). The excavations at Sitio Drago are directed by Dr. Tom Wake (Cotsen Institute of Archaeology, UCLA). A low resolution map, based on data collected with a handheld GPS-receiver, of the wider environs of the site and a high resolution contour map of Sitio Drago showing the present lay-out of the site. 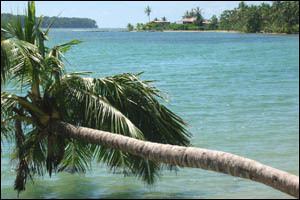 Approximate position and date of the site: Isla Colon is an island in the Bocas del Toro Archipelago, off the Atlantic coast of northwestern Panama. The island is named after Columbus who sailed between the island and the mainland in 1502, during his fourth trip to the New World. 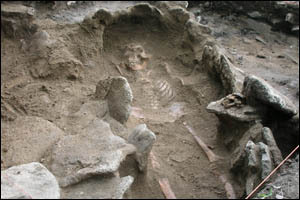 Archaeologically the province Bocas del Toro is part of the Greater Chiriqui area. Precious little research has been performed in this region that is currently being developed for tourism (replacing banana, pineapple and teak plantations). Based on the recovered artifacts (including San Lorenzo and Bocas type ceramics), and a series of radiocarbon samples, Sitio Drago has been dated to ca. 800-1200 CE. Sitio Drago is just east of the small modern settlement at Boca del Drago, consisting mostly of second and retirement homes. The site comprises about a dozen low mounds of ancient household refuse on the small strip of dry land between a swamp forest and the coast. The site is cut by a modern asphalt road and has possibly partly subsided below the current level of the Atlantic Ocean. Finds include ceramic vessels with decorated legs (made to also serve as rattles) as well as beads and other ornaments made of shell. Further inland, about 3.5 km. east of Sitio Drago, is Sitio Teca, dated to the Aguas Buenes culture (ca. 0-400 CE). My work in Panama would not have been possible without the Cotsen Institute of Archaeology.